Encouraging sales is a central part of any business. You are likely to be competing with other organisations in your field on a number of different counts; in the first instance you may compete on price, while it is likely that you will also be trying to make your offerings unique in some way, in order to ensure that you don't constantly need to undercut your competitors and therefore reduce your profit margins. On a more basic level, however, many customers will simply choose to deal with the company that makes the act of purchasing as simple as possible. As such, you should consider applying for credit card merchant status in order to make payment as easy as it possibly can be. There is a general misconception that credit card merchant status is reserved for already established businesses. Some advisers will tell you that you require around three years' worth of accounts before a bank will consider allowing you to become a credit card merchant. However, as credit cards have become more profitable for banks and have become a more widely used form of payment, it has become easier to gain credit card merchant status. While many banks will still prefer to see a trading history, they will all agree to look over a business plan with turnover projections in lieu of accounts. If you are approved then the process of getting and setting up your equipment is very simple; it will arrive in around a fortnight, and you will be given guidance regarding how to connect to the bank's system. The benefits of becoming a credit card merchant are manifold. In the first instance, sales will be encouraged if you are offering a range of payment methods. Furthermore, becoming a credit card merchant is an attractive alternative to offering a credit line to customers. If a customer's finances are in temporarily poor shape, then you may be tempted to extend credit in order to guarantee a sale. However, getting your money at the end of the credit period can be difficult. Becoming a credit card merchant allows customers to use their existing bank credit, and saves you the hassle of chasing debts. Similarly, if you wish to take payment online, becoming a credit card merchant provides a safe and potentially cost effective method of doing so, particularly when compared with the costs of using a service like PayPal. 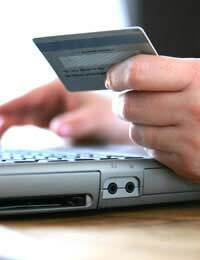 There are, however, a number of factors to consider if you are thinking of applying to become a credit card merchant. Primary amongst these is the potential strain on your finances. Regardless of the number of transactions, banks will charge around £20 per month for the lease of the equipment. You will also be liable for a set-up fee of around £150, as well as a charge of around 3% per transaction. If you have a high volume of transactions, however, this will still prove more cost effective than PayPal. You must also address the question of what type of transactions you will be performing. If you wish to take payment online or over the phone, you must also apply to take 'customer not present' transactions, which can trigger more extensive fraud precautions. Finally, you should also consider which cards you wish to accept. Some, such as American Express or Diners Club, must be applied for separately, at an extra cost. The process of applying for credit card merchant status can appear complex. However, the potential benefits for a growing business are significant and, as such, you should investigate whether or not it will prove beneficial to your company. Flexible Pricing: Should I Negotiate?